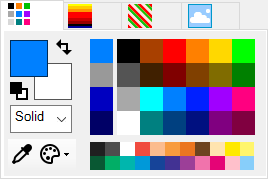 This palette allows you to select colors and materials for painting, drawing, filling, and retouching. Use a color to fill the interior of a shape or an area of the image. Use a multi color gradient to fill the interior of a shape or an area of the image. Use a pattern to fill the interior of a shape or an area of the image. Use an image to fill the interior of a shape or an area of the image.